Once upon a time, DC Comic's Vertigo Comics Imprint was the go to publisher for adult oriented, and intelligently challenging, original comic books. Hellblazer, Sandman, Fables, Transmetropolitian, and Preacher still rank as some of the greatest comic book series of all time. Mike Carey's Lucifer series deserves a spot among those titles as well. 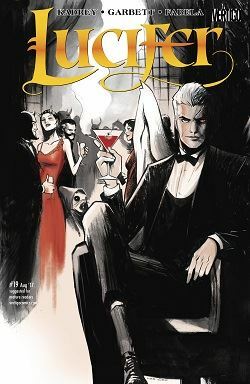 Unfortunately, Vertigo Comics couldn't get lightening to strike twice and the re-launch of one of Vertigo Comic's most popular characters has ended with the current issue. That leaves five or less Vertigo Comics titles being published or planned monthly. What happened to one of the best imprints in comic book history is a story for another time. We can only discuss the end to their latest ongoing series here. Lucifer Vol. 2 was, obviously, not as popular as the previous volume, even with the help of a (not so similar) television series. Granted, the TV series has been pretty different from both comic book series, but still a connection can be drawn. The character has appeal, both on the screen and on the page. Why then didn't this new series succeed? The writing was solid. It started with Holly Black and then Richard Kadrey took over. Both ably updated the character while giving him both cosmic (new incarnation of The Presence) and mundane (a new nightclub-still named Lux) complications and a solid cast of supporting characters. Artist Lee Garbett brought Black and Kadrey's stories to life beautifully. Maybe the series was too similar to Carey's or didn't quite rise to its artistic heights? These things are debatable. All that matters is that it didn't sell, and now it's cancelled and the Vertigo imprint is lesser for it. Kadrey ties up all the series' loose ends capably, albeit if too quickly. That's to be expected though since he had only 32 pages to tie up the events that had unfolded over the course of the last 18 issues. He manages to leave all of the characters intact, except for The Presence (that's also a pun as you'll figure out after you read this final issue). They can be taken back out of the toy box at some point in the future, if sales projections and potential bottom line goals look like they'll be met by another volume of the series. Unfortunately, if Lucifer can't succeed as a comic book while the property has a moderately successful television show, it appears that another volume isn't necessarily on the immediate horizon. So that's it for the latest incarnation of Lucifer on the page. I just hope this isn't a sign of the same for Vertigo Comics as an imprint.